Potatoes are raised from 'seed' (smallish tubers) which are available in late winter or early spring. There are Early, Second Early and Late or Main Crop varieties, this refers to the length of time they take to develop and not when they are planted - all types are planted at the same time, though maincrop varieties can be planted a few weeks later. Place the seed tubers in trays with the 'eyes' upwards in a cool, frost-free, BRIGHT place, but not direct sunlight - a process known as chitting. This allows stout shoots to develop, not the spindly, etiolated ones which grow in the dark, and as they develop leave only about three strong shoots on Late varieties, but allow all of them to remain on Early and Second Early varieties. Plant out as the soil warms up, traditionally this was when the grass started into growth in mid March, but the warmer conditions now experienced make determining this point more difficult. Incorporate plenty of organic matter - preferably well-rotted manure - in the bottom of the trench. Space about 40cm apart and 20cm deep in rows about 50cm apart, ensuring that the end with most of the 'eyes' or buds, is upwards - the 'rose end'. Earlies and Second Earlies can be planted a little closer. Some people recommend placing a clump of grass cuttings around the tuber to discourage Scab. When the shoots appear above ground mould them up by dragging soil up and over them - they will soon reappear. This protects them from late frosts and increases the crop as the new potatoes are produced from the stems. Also it keeps the maturing tubers protected from light which causes them to become green and inedible. Planting an Early variety such as Homeguard or Pentland Javelin could avoid Blight which usually occurs in the late summer when they will have matured. 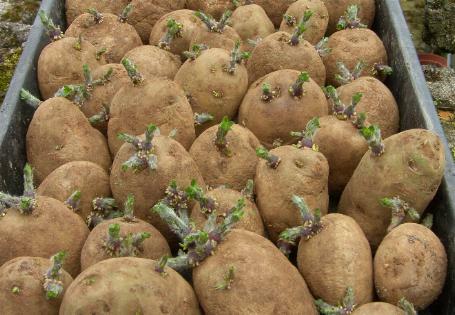 As the tubers come to maturity the topgrowth starts to flower, these should be picked off to give a heavier crop; also ensure that they have plenty of water at this time to swell the tubers. If there are small black Slugs (Black Keeled Slugs) or Wireworms in the soil, all of the tubers should be lifted, otherwise they can be harvested as required - try to find every last one, even the tiniest will grow the following year and can carry over diseases. As well as Blight look out for signs of Black Leg. They may also get Scab, but it is only cosmetic. They have to be stored in the dark to stop them developing chlorophyll and turning green. A low temperature is also required to discourage the buds from breaking into growth. A broken chest freezer makes a good store as it keeps the potatoes dark and away from rodents. Stack them on crates or boxes, storing only sound tubers and check periodically for signs of rot or developing shoots - the latter will cause the tubers to shrivel up, so they should be rubbed off. Potatoes are easily grown in containers or stout plastic bags, if there is little space or to grow some indoors out of season, eg. plant a few in the autumn for a treat at Christmas. Plant some tubers near to the bottom, and top up with growing compost as the shoots develop until the container is full - special potato-growing bags are available, but any stout bag which is light-proof to prevent the tubers from going green, and with drainage holes, can be used, eg. a bark or compost bag turned inside out. This method is also a way of avoiding problems with soil pests. Another, but less common problem for gardeners is the potato cyst nematode, or eelworm. This is a tiny roundworm about 1mm long, which causes small, roundish cysts to develop on the roots. The nematode eggs hatch when stimulated by a chemical released from the potato plant and the larvae invade the root-tips, causing cysts to grow. This damages the plant, which grows weakly, turns yellow and may wilt. The two culprits are Globodera pallida (the white potato cyst nematode) and G. rostochiensis (the yellow potato cyst nematode). They can attack other members of the Solonaceae Family such as tomatoes or aubergines, and sometimes Bittersweet (Solatium dulcamara). They can be introduced on infested tubers or by transferring soil on implements. Once infested the growing area needs a rotation period of about ten years to control the numbers, if growing potatoes, or tomatoes which are also affected. Cysts containing viable eggs can be present for about 20 years after the last crop was grown. Recently it has been found that growing Lychee tomatoes, Solanum sisymbriifolium, removes the nematodes, so this may be the solution to this particular pest. The presence of the Lychee tomato plants induce the cysts to develop and as there are no food plants present, they expire. To avoid carry-over of diseases to the following year use a crop rotation system so that the next crop is in fresh ground that has not been used for potatoes for 3 to 4 years. If you have not had a disease problem you could save some of your own tubers for 'seed', but it is best to use new certified seed every year. Most are raised in Scotland and even Egypt imports them from there. A new cultural technique uses stem cuttings grown in sterile conditions to produce mini tubers which are planted up to yield disease-free 'seed' that can be replanted for up to 10 seasons. They should be available in 2011 under the names NVS Amour and NVS Sherine.